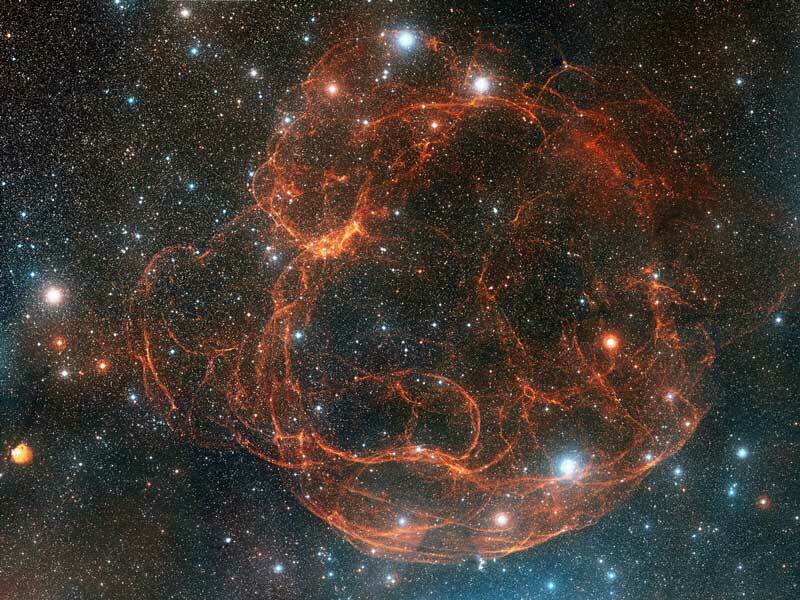 Explanation: It's easy to get lost following the intricate filaments in this detailed image of faint supernova remnant Simeis 147. Seen towards the constellation Taurus it covers nearly 3 degrees (6 full moons) on the sky corresponding to a width of 150 light-years at the stellar debris cloud's estimated distance of 3,000 light-years. The above image is a color composite of 66 blue and red color band images from the National Geographic Palomar Observatory Sky Survey taken with the wide field Samuel Oschin 48-inch Telescope. The area of the sky shown covers over 70 times the area of the full Moon. This supernova remnant has an apparent age of about 100,000 years - meaning light from the massive stellar explosion first reached Earth 100,000 years ago - but this expanding remnant is not the only aftermath. The cosmic catastrophe also left behind a spinning neutron star or pulsar, all that remains of the original star's core.